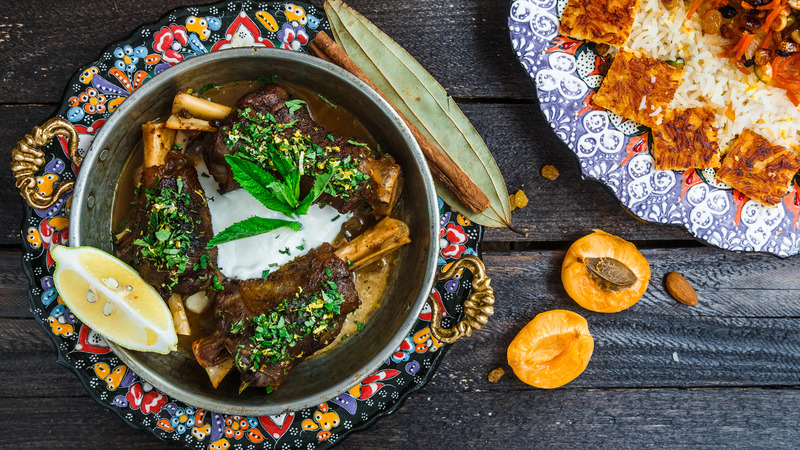 The Culinary Excellence Of Persian Food: 6 Must-Try Dishes! This much-celebrated slow-cooked stew brings together tart pomegranates and chicken/duck in what ends up to be an earthy, aromatic, and rich stew. Traditionally made with duck, other kinds of meats and even fish are used to make this relatively easier Khoresht. Add to that, the nutty taste of walnuts and you have yourself a low-key feast of Iranian culinary goodness. While Iranians make their rice simply with butter and saffron (aka Chelo), this one has a distinctive taste but is a marker of Iranians’ preference for sour flavours in their dishes. Barberries, used in this dish, are a like cranberries but much more sour. The dried ones are added to the preparation but not before re-hydrating them before the cooking. It’s the simplicity of this rice preparation that makes it the perfect accompaniment with all the rich kebabs. The Chelo Kebab is the national dish of Iran and if you’re assuming that the Iranians leave no stone unturned in the preparation of this elaborate and widely-favoured kebab dish, you are not mistaken at all. But, the Chelo Kebab has different kinds and the Koobideh is the simplest but one of the most succulent meat preparations in Iran. Ground beef with minced onion, salt, and pepper may sound simple but tastes anything but ordinary. Plus, classics are mandatory! Iranian rice cake prepared with yoghurt, saffron, egg and chicken fillet is the thing of dreams! No matter how many cakes you have had in your life, Tahchin will bowl over each one of them without even trying. The lower most part of the cake is called Tahdis and is the crunchy and almost-burnt part of the fried rice, which adds just the right bite and crunch to go with the white rice part of the cake. This dish can be prepared in a number of ways, for example, using vegetables and fish, but it would also taste as jaw-dropping and pupil-popping as it does. The Sabzi Khordan is an important part of every Iranian meal. It is a herb and cheese platter which includes mint, tarragon, basil and cilantro, alongside scallions, radishes, walnuts, feta cheese and Iranian nan (flatbread). Basically, everything you need to customise your own Iranian sandwich. Tear off a piece of the flatbread, tuck in some herbs of your choice and the cheese, and voila! The herbs help cleanse the palette between generous servings of stews, meat, and rice. Once you’re done admiring the visual treat that this dessert is, you can dive right into its flavourful lusciousness. This date and walnut pie is a dream of a dessert. The dates are stuffed with walnuts, covered in burnt butter and flour mixture. Finally, it gets its vibrant green colour from the generous garnish of cinnamon, cardamom and pistachios.